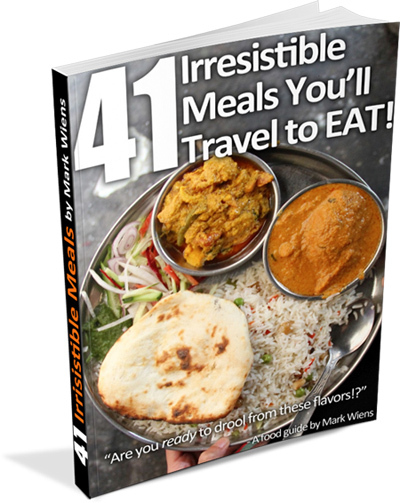 You’re on the prowl for a new culinary adventure. You’ve been scanning this site searching for the next exotic taste sensation and you’ve made up your mind. You’re going to take the plunge and taste the King of Fruit, the Durian. Its ungodly odor regularly causes evacuations in hospitals, shopping malls and office buildings. It postpones planes. It’s banned in subways, buses and hotels across Southeast Asia. Heck, even Andrew Zimmern can’t stomach the durian. But despite its bad reputation, tasting a durian is a lot tamer than a lot of the exotic foodstuffs Mark has eaten. For one, durian doesn’t have an exoskeleton to go crunch when you take a bite. Once you chop through those threatening spikes, the durian is a soft, cream-filled delight that isn’t scary or particularly disgusting at all. That is, if you get a good one, and most durian newbies don’t. They get one that’s so under ripe it tastes like eggs gone wrong or one that’s been left in the tropical sun until it’s oozing. Then they go home thinking durian is just as terrible as everyone says. It’s like if you’d never tasted cheese before and someone gave you a slimy stick of string cheese that had been baking on the car dash board on a particularly hot summer day. Would you go home thinking that cheese is awesome? Probably not. 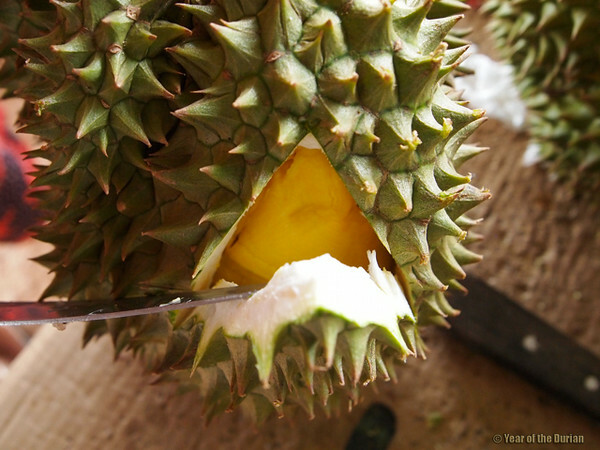 Finding a perfectly delicious durian can be difficult even for me, and I’ve spent the last two years tromping through the markets and jungles of Asia on an obsessive durian scavenger hunt. I believe that everyone can come to appreciate durian. Whether you’ve been knocking around Asia for a while or salivating over Mark’s culinary adventures from the safety of home, I want your first durian experience to be as totally awesome as possible. Here are my tips to make sure you enjoy your first taste of durian. Until you’ve had durian, there’s no way to guess what it tastes like. A big mistake is expecting durian to be like other fruits. In the West, our fruits are juicy, slightly acidic, and sweet in a one-dimensional, sucrose way. Durian is not. A bite of durian is a creamy explosion of incongruent flavors that lights up taste receptors all over the tongue. No food in the Western palate really compares well to durian. None. Zilch. Cheese comes close – sometimes. Butterscotch pudding – occasionally. 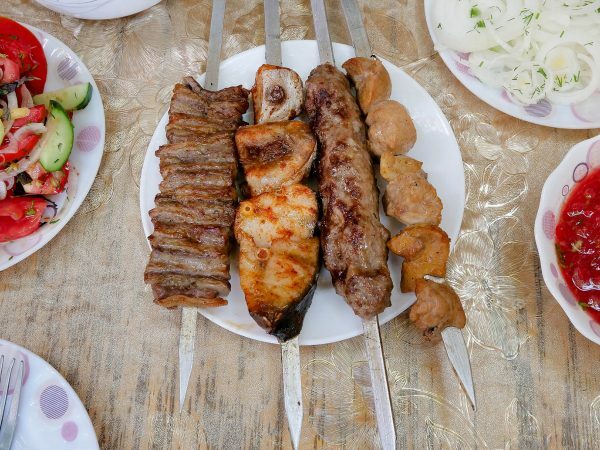 Onions caramelized in wine – it depends. Durian is a strange combination of savory, sweet, and creamy all at once. A durian is supposed to have subtle hints of chives mixed with powdered sugar. It’s supposed to taste like diced garlic and caramel poured into whipped cream. So relax and let the cacophony of flavors blow you away. Durian is different (in a good way). We’re all a little different. My little brother likes tart Granny Smith apples. Personally, I love sweet crunchy Fujis and Galas. Somebody out there can’t get enough of those mealy Red Delicious. Just like apples, there are many varieties of durian ranging from soft as dark chocolate whipped cream to crisp like a caramel apple. There are some types of durian you may never learn to like, in the same way some of us will never understand the buzz about goat cheese. And that’s totally okay. Liking a durian the first time has a lot to do with choosing the right one for you. The variety is immense, and if you want to experience the full range flavors you’ll need to do a little internet research. In general two categories to choose between are durians that are either “wet” or “dry” in texture, or ones with a predominantly “sweet” or “bitter” flavor. 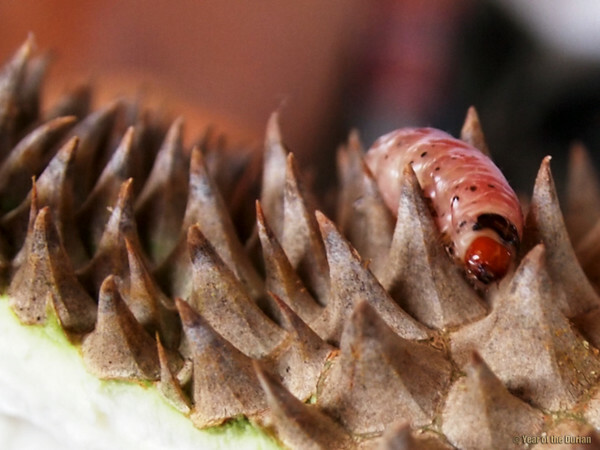 If you think avocados are slimy and gross, stick with “dry” durians. Just ask the durian seller for help, but be aware that not all durian sellers have your best interest in mind. Durian is a high end commodity. In some places people pay crazy amounts of money for a good one. People have stabbed each other over durian. But like pearls or anything highly coveted you can get sold a lot of fakes. As a newcomer to durian you are a sucker, and everybody in the durian business can see it. So when a tourist heads toward a durian stall, too often the seller’s thinking he can sell you anything because you haven’t a clue and won’t like it anyway. He’s right. Most tourists have no idea what a durian should be like. And if he always gives tourists his worst durians, they’ll always make a yuck face and walk away. Then his theory has been proven correct, creating a vicious cycle. The best way to deal with this is to go to a durian seller with a good reputation, or go with a friend who knows their durian. Until you know what to look for, avoid buying durian from small carts wheeling through tourist areas. If you’re on your own you can still get a good durian. Just exude a little confidence. Handle the durian. Feel the spikes. Smell it. The durian seller will probably respect you more and will give you a better fruit. Just make sure to keep a look out for warning signs of a durian that’s just plain bad. The worst thing you can do if you want a good first impression is to taste a durian so downright nasty we durian fanatics wouldn’t touch it with a five foot straw. Overripe durians will taste like B.O. and vinegar. 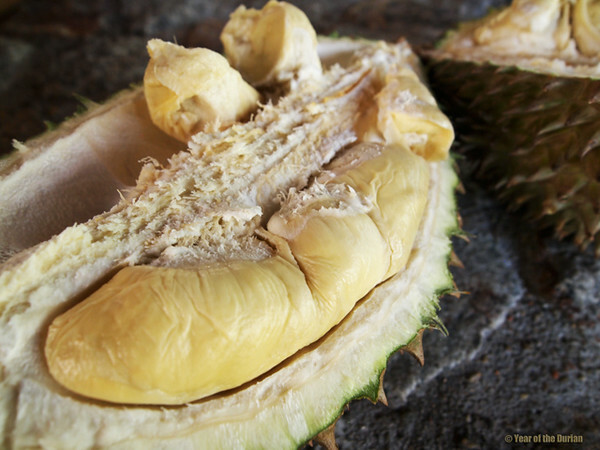 Durians with fungus spots or mold on the shell will taste watery and – you guessed it – moldy. Durians picked under ripe may not ripen properly and can have no flavor at all, or a an unpleasant undertone that tastes like metallic scrambled eggs. Is the stem a totally wrinkled up, dark brown wisp? It’s too old. Does it have big spots of discoloration on the spikes? It’s infected with fungus. Is it splitting wide open? It’s too old. Are there holes drilled through the thick spiny shell? It’s probably infested with caterpillars or mealy bugs. Unless you think bug poo is cool, reject. When you touch the durian flesh with one finger, is it like touching a cream-colored rock? Reject it. Is the flesh so soft it’s translucent and a little runny? Try to find one that’s slightly more firm. There are a number of other things to look out for, but those are the main ones. For more check out How To Choose a Perfectly Ripe Durian. For the best first experience, go to a well-known durian seller or go straight to the farm. Durians don’t last long in the hot sun, and the fresher the better. Durians eaten on the farm usually taste better because they haven’t been picked under ripe or allowed to ferment on a truck in the tropical heat. In addition, by going to the farm you can see for yourself how well cared for the trees are and if any unhealthy chemicals are being used. It’s an enriching experience to see the fruits hanging on the trees moments before consumption, or even getting the chance to harvest the durian yourself. 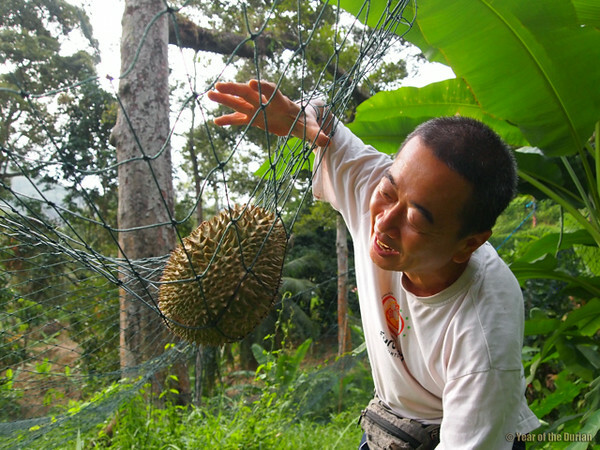 If you can’t get to the farm, try to find a really renown durian seller. Choosing the perfect durian is a bit of an art. 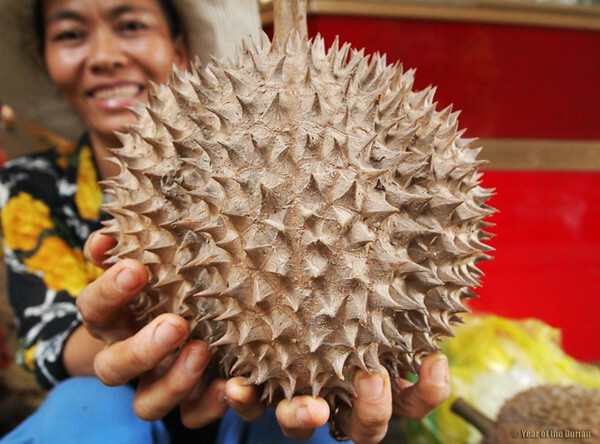 Some durian sellers have been opening durian for a half a century, and have phenomenal noses. Using their keen sense of smell, they can differentiate between a durian with the flavor of Fruit Loops and one that tastes like a Snickers bar. They’re amazing. You really can’t go wrong if you visit one of these guys. He (or she) will reject the nasty durians for you. He’ll set you up with the durian that’s the right fit for your taste preferences. You’ll need to pay a little bit more for the service, but it’s worth it because the seller genuinely wants you to have the best possible experience. Just like me. Who’s ready to eat durian now? i have seen durian around the internet and wanted to try. i live in california and durian isnt in my “neck of the woods” . i am in redding, ca as i write this (on vacation) and there are durians here. there are several asian markets they do have fruit ( fresh or frozen i never asked). i opted for durian candy. i know the focus of this page is fresh but a durian treat or snack might even give a basic what to expect without going fresh. My first time trying it was in an asian “new years cake”. It tasted like onion. Onion is the #1 food I dislike and try to avoid. No more durian for me! No way! I still don’t want to eat one. I’ll stick with the “1 demential” fruit of the western hemisphere. Besides that I don’t think I will ever go there as I am terrified of heights and would fly if I could keep one foot on the ground, and I can’t swim so I don’t think I would go over on a ship either. I will just pray for my friends who are missionaries in Thailand and go by what they think of this fruit. But for me No thank you. Oh my God. Who hurt you this bad? All jokes aside, though, it sounds like you’re describing an acquired taste. Im convinced and will try, again! Oh at least want to try again. I’ve lived in S.E.A for almost 20 years and have always avoided durian like the plague. The first time I had durian was when I was 21 on holiday in Phuket. I had no idea. The smell was off putting but the vendor ,a rather charming ladyboy convinced me they were the best durian of the season. He demonstrated the long sturdy stalk and tapped all over it with his manly machete, making lurid and suggestive motions with his lips. There was a whole posse of primarily male truck drivers all waiting for the same durians. So I thought why not, at worst I thought it might be some kind of “man jam” like they call bitter Seville orange marmelade back in the Nordic countries. He was also an extremely handsome ladyboy with those perfectly chisseled cheek bones, large adam’s apple, lips like Mick Jagger on his fourteenth birthday. So I gave my best smile and he immiediately set about carefully choosing me a suitable durian. I had never met a ladyboy and my hormones were in wildly conflicting modes of excitement. He seemed to relish this surge of helpless bewilderment in a delightfully charming way. The spell was only broken when one of the truckers thrust his hand forward with some cash demanding we took our flirting elsewhere. So in high excitment I rushed back to my beach bungalow some four miles away to taste of the forbidden fruit, only to realise I needed a machete. Luckily someone had been harvesting coconuts nearby and happily did my durian for me. It was quite large and looked like a dead bodily organ and smelt like one too. Undetered I lifted the grotesque looking thing to my moist quivering lips and took a nibble, images of manly ladyboy whirling around in my head. I was almost delirious with anticipation. Well it wasn’t to be, not exactly, at first I tasted a mild spiciness like black pepper which made my eyes light up, then a full bodied toe jam odour hit my flaring nostrils as a sweet yet rancid taste of vomit hit the back of my throat making me throw up. The coconut harvester wouldn’t dream of relieving me of the rest, he insisted it was all for me. He made slightly rude gestures with his fist indicating it would somehow be of benefit to my now completely crushed libido. This he finished with an alarmingly wicked smile. So hanging my head I took the scary beast back to my room and using my flip-flop dug a hole in the sand and buried it. Firming it down with all my weight. I never tried again. Of course I keep seeing them everywhere I go and I never forget that first moment, taste and sensation. It was all part of my right of passage as a young man. Now strangely Im again curious, certainly after reading this. I decided ladyboys weren’t trustworthy, so that mornings little obsession put me straight, though I still wonder what could’ve been. Recently I saw pink durians in the supermarket. Much smaller more petite, grotesque yes, but fresh looking being pink. Like two lively looking little testicles, skinned at the butchery. 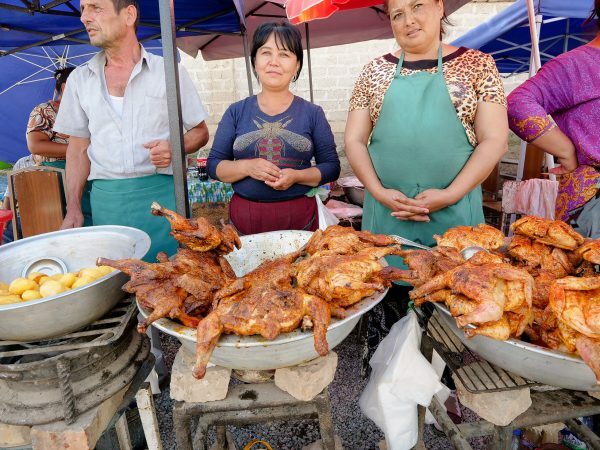 Having lived in China Im not squeamish but Im wondering if I see them again should I go for it? Are the pink variety superior in any way? This time I will have my wife’s help, at least for assistance should I need it. I seriously doubt she would try herself, she’s very picky about what she eats as she’s a wine taster, tending to smell rather than taste most things in order to protect her livelihood. It’s true there are so many varieties and absolutely yes smell is no guarantee after all most I’ve ever caught whiff of were the same, completely utterly revolting. Coud pink turn me around? I live near nyc and tasted my first durian lately. My family loves it and said it tasted like banana and mango where as I tasted it and could barely swallow. To me it tasted like onions garlic and chives that were sweet. Did I do something wrong? Hey Nick, it can really depend on the durian that you get. Was it a frozen durian? 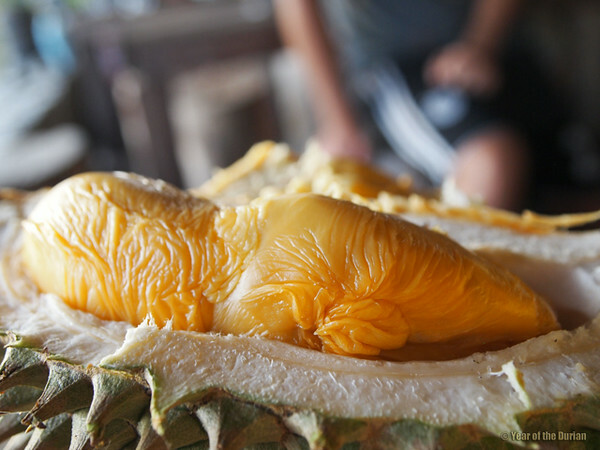 Your family probably tried Jackfruit not durian. Hey Mark!! How about you send us followers a good Durian fruit!! That way we can tell more people to try it and like it!!!! Always ready for a durian, also two ! Hey Ivana, so good to hear that you love durian too! Until I saw your articles, I never knew about Durian. I just google’s about Durian in our location – it is called Durian in our local language also. Some say it smells like hell and tastes like heave.. I think I have to taste it. Hey, thanks for reading, glad you know about durian now! I didn’t realize there were so many varieties of Durian! 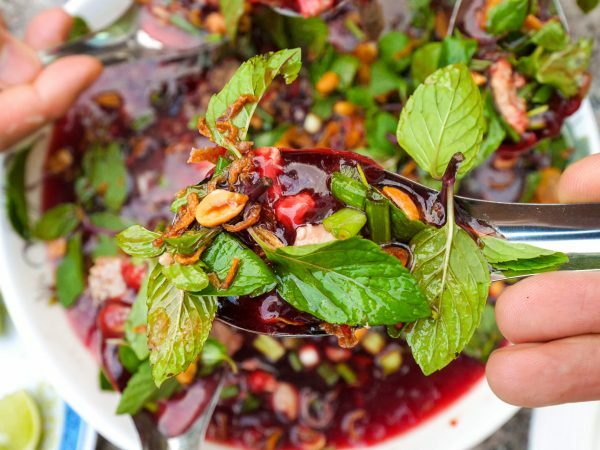 I tried it for the first time earlier this year in Thailand and loved it! Hey Ashley, it’s so cool that you love durian too!